September is upon us, and while it’s not the official first day of fall, it sort of is in our books. It’s the perfect month to ease into fall as the kids go back to school and the summer weather is still lingering, but slowing changing. Kate and I together decided we wanted to challenge ourselves to focus on personal health and fitness goals for 1 month, 30 days straight, and we thought it would be even more fun if you all joined us! September is tomorrow! If you want to jump in, this post is for you. Don’t forget, we have an amazing resource page linked on the front page of our website where you can find tons of info, recipes, workouts, playlists, inspiration, and more. Just click the “Fit Club” link on the front page, or go here! People have been asking us for a little more guidance and structure so this post is all of the steps that we go through ourselves and we’re hoping it helps all of you to get in that mindset as well. Let’s get started! We like the Diet Bet platform because it provides a little accountability and motivation and it’s something you can do with friends. 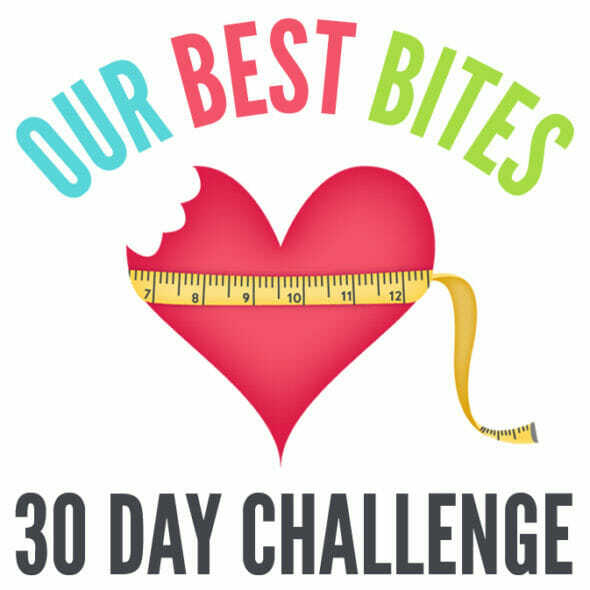 Our Diet Bet starts TOMORROW, September 1st! If you’re unfamiliar with DietBet, you can find all of the info in this link. Although everyone who meets their goal gets to split the DietBet pot (currently over $20,000) the point is not to make gobs of money. The point is to not LOSE your own money, and the bonus is that you get to gain a little in the process! We purposely started this DietBet on September 1st so we could focus and dedicate one solid month to this cause. You can do anything for 30 days! We will be posting tips and messages within the DietBet app so please join us there. And remember, click that “invite friends” option because the person who invites the most people wins a prize pack from Our Best Bites! Once you’ve joined the DietBet (if you choose to) get organized. This might just be me, but I have to kind of mentally organize my game plan and get ramped up for challenges like this. 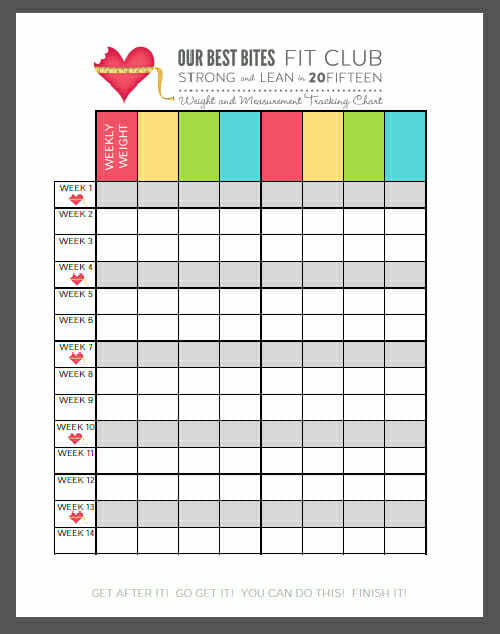 To track your progress, print off this free chart. There are instructions on what to do with it in this post. You’ll see it is formatted for long term, but start now on day 1 so you can keep track of your progress. Place it somewhere prominent, like a bathroom mirror, so you are constantly reminded of what you’re working on. I suggest taking your scale weight once a week at most, and only taking your measurements on day 1 and day 30. For me, another part of getting organized is cleaning out my fridge and pantry. Something about having those 2 areas in shape motivates me to eat better. So you may want to do that too! Head to the grocery store and stock up on lots of great healthy ingredients and snacks. The answer will differ a little depending the person, but I always follow fitness pro Jamie Eason’s rule of thumb, which is this: Multiply your goal weight (your realistic, healthy goal weight) by 10 and then add 200-500 calories depending on your activity level. So let’s say a realistic weight for you is 140 pounds. 140 x 10 = 1400, and add 200-500 so your calorie range is 1600-1900. That means on average or low activity days you should stick to closer to 1600 calories max, and if you are exercising actively you can go up to 1900 calories, but anything within that range is your target. This system has always been spot-on for me. Beware of dropping your calories too LOW and not eating enough. Avoid extreme nutrition, where you are removing any major food groups from your diet. Go ahead and eat moderate amounts of everything, just take the time to weigh, measure, and keep track of what you’re eating. I promise you can still eat great-tasting, normal food, while being healthy and losing weight! That is the whole premise of our cook book and if you don’t have this one yet, it’s a great companion to this challenge. Try cooking dinner from the book every day for a month- it will make things easy! Set a goal for your self right now, to be active. This will be different for everyone since we’re all at different activity levels. I would challenge you to at minimum attempt 30 minutes of exercise 5 days a week. That might mean you’re just going for a brisk walk every morning. If you go to the gym and you are either new to weight-lifting or would like to start, I recommend Jaime Eason’s Live Fit Trainer. Beginners can start in phase 1 and more advanced lifters can hop in on the last phase. If you work out at home, we have a whole collection of amazing workouts developed by our professional trainer, Jani. Click here and scroll down to the “Weekly Workout” section to see those. We even have videos for most of them on our You Tube Channel! A fitness tracker might be helpful in this area for some of you as well. Click here to read about fitness trackers that we love and use. Follow along with us. Be active within the DietBet message boards, and make sure you are following our FitClub Instagram Account —> Here. During this next month we’ll do our best to help you out, but you’ll also see a variety of recipes here on the blog since we’re still writing for the masses, so just keep that in mind 🙂 Talk to us, ask questions, and tell us how you’re doing. If you have questions for our Trainer, Jani, ask those as well and we’ll have some special posts on The Scoop addressing any topics you’re interested in! 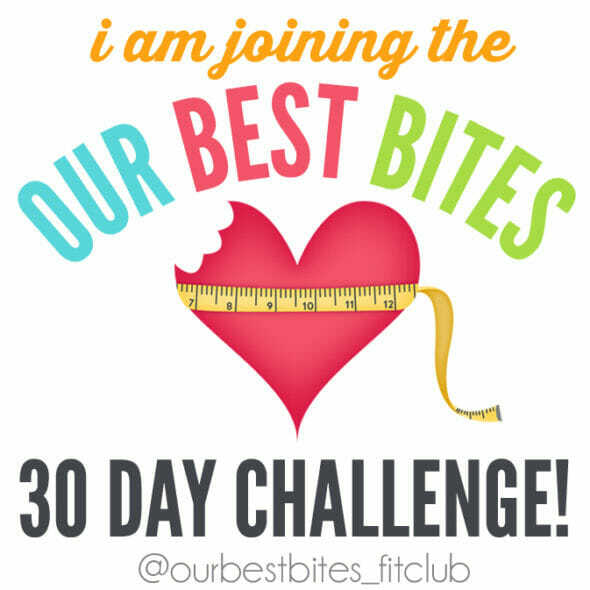 If you’re going to join us in this 30-Day challenge, share this image on social media, and make sure to tag us so we can see! I have never done one of these, but it is time. Thank you so much for organizing this! I read a new book recently called “Lose Weight Here.” The author talks about fine tuning your diet. It is totally worth the read!! Nothing fancy or magical, just common sense. Some bodies need more protein, others need more whatever. The author explains things in bites (3 more big bites of X). For me, I found that with my workout schedule, I had to eat well over 10x my body weight in calories to seriously start losing weight. 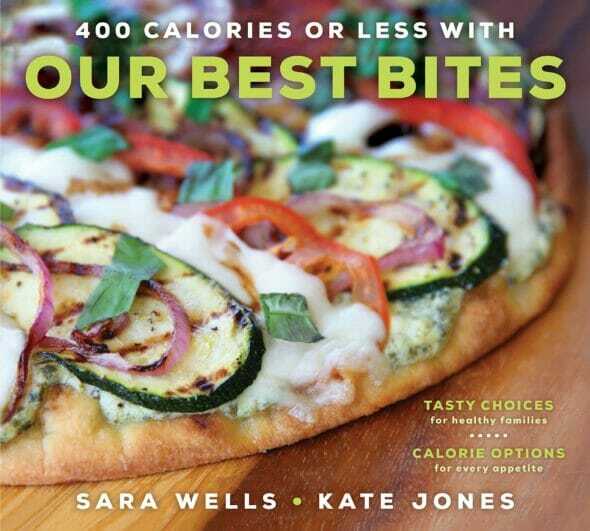 So i do believe I’m joining your diet bet as extra motivation, and I do believe I’m buying myself your book that I wanted anyway, cause cooking at 400 calories or less per meal is the part that seems impossible, lol!! You just re-affirmed what my plans were for september, and ya know what? I’m gonna do it with you this time!! Ooooo! I am so excited. I finally made it to my pre-pregnancy weight but I would love to lose just a little bit more. I am a huge fan of daily burn and have made it a part of my day every day! I love these challanges. I think I do better when I compete. Thanks, Ladies! I joined the diet bet today and I am soooo ready to get started!!! I am excited about this month! I did the last diet bet and won but I don’t think I am going to do it this time. I am right at the tail end of my weight loss journey where every pound is sticking to me like glue and its just a lot harder to get these last few off so I’m going to sit this one out (not literally sit because I am going to keep on keeping on when it comes to working out and eating healthy), but I am super excited for all the other stuff going on around here this month! Thanks for doing this fit club…I just love it! The end is the absolute hardest- keep at it! Hi! You had mentioned in a previous post that you had extra prizes for this diet bet. is that correct, or did I miss read something?? Yes! The person who invites the most other players to join will win a prize pack from our Shop! We’re also giving away cook books right now on Insta- look for the 30 day challenge post! Just wanted to say thanks for motivating me to lost 30 pounds since April! It all started when I read Sara’s post about her personal journey losing weight. I bought your cookbook, started cooking from it, logged all my food in My Fitness Pal, and amped up my workouts at the gym to include more weights. Thank you! I feel great! Oh my gosh, I LOVE this! Congrats girly! Can I share this on Insta? I love hearing inspiring stories like that! I like the calorie range calculation you have above (do-able and maintainable, I think) but have a question…how should it be adjusted for mega-calorie burn days, if at all? A 15 mile run burns about 1500 calories…which makes 1700 (the upper end of my range) seem very low for the day.